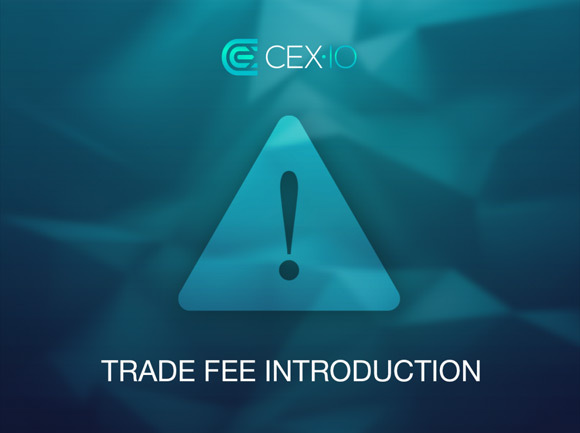 The Bitcoin cloud mining service and exchange CEX.io has announced its plans on introducing trading fees on their exchange. Up until now trading there did not have any fees, making the exchange very attractive place to trade due to the large trading volume as well. The lack of fee was also interesting if you were using an automated trading solution as it could more easily realize a profit without having to take into account a fee when executing trades. It was expected that sooner or later a fee would be imposed as crypto currency exchanges usually do get their profit from trading fees. The introduction of the trade fee should happen within two weeks according to the official information and it will be implemented in two stages. Starting with a fixed commission of 0.2% for everyone and and then a month later moving from a fixed to flexible fee between 0.2% and 0.5%, depending on the 30-day trading history of each user. It is interesting to note that the reason given for the addition of the fees is because the platform is currently preparing the necessary foundation for the introduction of US dollars trading on the exchange and apparently BTC/USD and USD/GHS trading pairs will soon be introduced. CEX.io has also announced their plans on soon introducing Litecoin cloud mining as well, though no date for that is yet announced and it could take some more time before they have the right ASIC hardware available to provide the mining power they need for that.